Introduction: Is Leo Vegas a casino or sportsbook to trust? Dolph Lungdren is even an ambassador for LeoVegas! Leo Vegas Casino was established in 2012 and now boasts a catalogue of more than 1000 real money casino games and developed a loyal following for its online sportsbook product. The Leo Vegas platform is available via your Web browser (no software download required) on all platforms with the mobile casino one of the best on the market and boasting upwards of 600 casino games. The casino holds multiple licenses, including from the United Kingdom Gambling Commission, Malta Gaming Authuority and several Nordic countries. International players can sign up (free of charge) to become a member, and safely deposit money to start enjoying real cash gambling via desktop, laptop, mobile, tablet and even Smart TVs. SPORTS BETTING 1000s of football markets, sports betting from most major countries including USA, UK, European countries and many others. BON– USES Yes depending on where you are – click here for more. 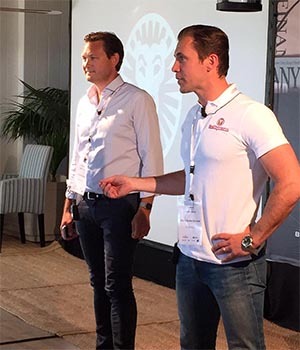 LeoVegas was founded by in Sweden by Gustaf Hagman who is the CEO and Robin Ramm Ericson who is also Chairman of the Board with their vision one that has turned out to be genius – to focus all their efforts on mobile. The product they have built was always mobile first and the company has stuck to this with some really unique apps that have made them a market leader in the casino industry. The company is also very strict in its compliance measures and even has its own responsible gambling program that has won awards and is well-known in the industry. Having said this the UKGC fined LeoVegas £600,000 for accepting bets from punters who had asked to be banned. The company LeoVegas Gaming Ltd. is a subsidiary of LeoVegasAB, which is the parent company and trades on the Nasdaq at the Stockholm Exchange. You get the drift – the LeoVegas guys do things by the book and have many stakeholders they must answer to. The company has copped some flack for closing down affiliate accounts, because of breaches of regulations (mainly in the UK) but this just shows their willingness to be trusted in regulated markets. In May of 2016 LeoVegas.com launched their online sports betting product LeoVegas Sports with it again having a prime focus on mobile operations. The company has also been active in acquisitions as it continued its push into regulated markets, with the purchase of Royal Panda for f €60m being finalised in October of 2017. LeoVegas.com won the Online Casino of the Year and Mobile Operator of the Year at seperate awards shows at the beginning of February 2019, just prior to the ICE industry event in London. Leo Vegas Casino gives new players a welcome package when they initially sign up, if you are from an eligible country. This means you will make a deposit and then receive a matched deposit bonus or free spins on some great slots games. Follow our links to see what exclusive deals we have struck up with LeoVegas.com. New and existing players are also entitled to a host of other promos and competitions which are offered on a constant basis. Make sure you register with a live email address so you stay up to date with the latest offerings. Instantly start accruing VIP points when you play games for real cash, and you will notice your VIP bar grow the more you play – the more it grows, the more benefits and treats you acquire, such as tournament entry, special bonuses, game premieres, event invitations and more. Again the promotions on offer will vary from country to country, while some countries are ineligible to even receive promotions. Rest assured if you are in most of Europe, the United Kingdom New Zealand and many other countries you will be able to receive most promos. Leo Vegas Casino is a browser-based online casino (also known as ‘instant play’) that can be accessed across all data-enabled platforms, via any Web browsers. Click or tap on any of our Leo Vegas links and you will be taken directly to the Leo Vegas Casino registration page, where you can fill in the simple details required to become a member (such as name, username, password, email address, date of birth, country of residency and preferred currency). Before registration, you can browse through the assortment of casino titles on offer and enjoy them within practice mode to get a feel for the interactive and immersive gaming experience they provide. Once you have become a member, you will be able to securely make your first real money deposit, which will be credited to your new account instantly. Check out our section below on available banking methods to see which option suits you best. From the gaming lobby, you can access customer support, promotions, banking options (deposits, balance, withdrawals, transaction history) and your personal profile. All games are neatly categorised and at the base of the interface, you can find out more about Leo Vegas, the terms and conditions, responsible gaming and game rules. Enjoy hundreds upon hundreds of some of the most popular video slots games, including movie and TV based titles such as Game of Thrones, Aliens, Terminator II, Jurassic Park, Battlestar Galactica, The Dark Knight and The Dark Knight Rises, Tomb Raider, Creature From The Black Lagoon, Dracula, Scarface, Judge Dredd and more. Indulge in a massive variety of blackjack, roulette, baccarat and other casino table titles, all of which have unique twists and takes on their traditional namesakes. Leo Vegas boasts slick and easy to use mobile and tablet gaming platforms. Simply open any of our links directly from your mobile or tab device, and you will be taken to the browser-based mobile interface. Log in to your account or register one if you haven’t already, and you will have access to almost all the 700+ games available via the desktop version. All options like banking and promotions are available from the mobile and tablet interface, and you can also open your account and enjoy real cash games on any data-enabled Smart TV. Does Leo Vegas have an iOS or Android app? LeoVegas did delve deep into the native app scene for a little while, but they soon realised they were better off focusing their attention on their mobile website, because updates can be rolled out simultaneously, rather than making a user update their application software all the time to get new games. Now it’s as simple as creating a web app or shortcut on hour phone’s home screen to access the casino-sportsbook. Immerse yourself in a genuine casino experience with Leo Vegas’ live dealer casino, where you gamble with professionally trained croupiers dealing you real cards, spinning authentic roulette wheels, and drawing lotto numbers from actual ball hoppers. Available in real money mode only, watch live feeds of these games on your smartphones, tablets, computers and Smart TVs, streamed from regulated and licensed gaming environments, overseen by pit bosses and adjudicators and technicians. Chat with the croupiers and other live players, and enjoy features such as simultaneous table play, live music on demand, view customisation, side bets and ample more. The LeoVegas company also operates BetUK.com which obviously is a company targeting those under the stewardship of the UKGC. Having said this we are here to talk about the LeoVegas.com’s sports offerings which are powered by the kambi platform, which takes care of most facets of the online sports betting section. 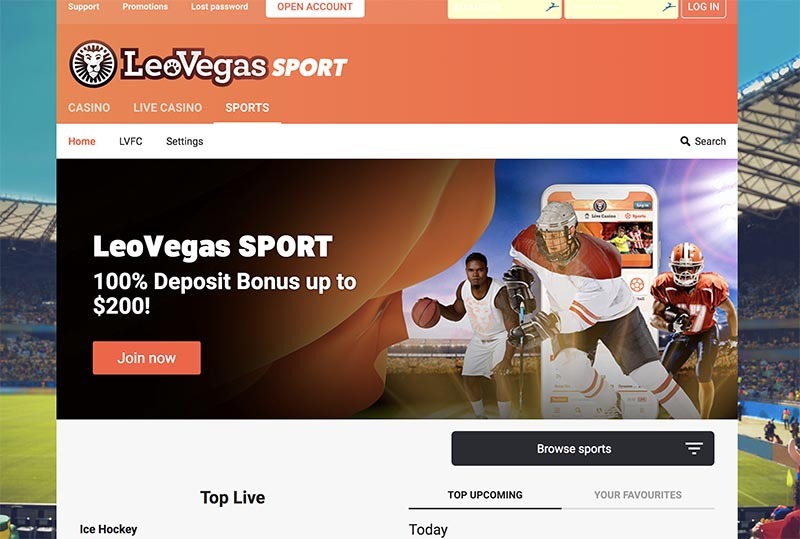 If we are being brutally honest the sports betting component of the Leovegas website is a little bit clunky, with it often confusing when you are trying to navigate and find different sports or events. There is one cool feature where you can hit one of about 20 different countries flags then it displays the local sports on offer there that are upcoming. If you compare the UK’s big bookmakers to the offering at LeoVegas it is not favourable but some of the advantages the company does have is multiple licenses, which allows them to operate in some countries that many of these UK companies don’t, like Sweden and Finland. All financial transactions are protected with the latest secure socket layer digital encryption technology, and no personal information is ever shared with any third party organisations. As a Leo Vegas Casino customer, you have the option to remove all your information at anytime from the casino’s database. First time withdrawers will be required to send through a copy of their driver’s license, or a copy of a utility bill with their residential address, or a copy of their credit/debit card used to fund their account, in order to verify their identification. It is only necessary to do so when making your very first withdrawal. Minimum deposits are $10, while maximum deposits are flexible. If you wish to fund your account with more than $1,000 in one go, contact customer support to let them know, and they should be able to satisfy your request. The minimum withdrawal at LeoVegas varies from country to country, but in most of Europe it is €20 while in Canada we have managed to withdraw $20. The company also puts a $20,000 limit on your monthly withdrawals but this is just without questions being asked. i.e. if you win $300,000 the casino will do its due diligence and open a dialogue with you to sort out your cashout request. Leo Vegas has a number of withdrawal methods including straight back to the card you deposited with (Visa, Mastercard etc), while other popular methods including Trustly bank transfers ad web wallets like Neteller. Unfortunately bitcoin is not yet an option at Leo Vegas. Because of UK and Malta licensing restrictions Leo Vegas will prompt you within 48 hours to verify your account, if you don’t, you risk having it suspended until you do. The good news is there is a simple online verification process for many regulated countries, however you may end up needing to send in scanned copies of a passport and utility bills to prove who you are. The online casino and sports betting products are both licensed by the Malta Gaming Authority and the UK Gambling Commission for its operations in the United Kingdom. The Leo Vegas gambling brand is also prominent in Finland, Norway and Sweden and other nordic countries with licenses held in those with regulated markets, and of course operating within EU guidelines. With Leo Vegas’s strict policy of operating in regulated markets, or those that allow offshore gambling, the company hosts games from many of the best regulated casino software companies. Leo Vegas Casino is a company registered in accordance with the Maltese Law, and is licensed and regulated by the Malta Gaming Authority (MGA) and the U.K. Gambling Commission. It also has its random number generated gaming software tested for fairness on a constant basis to ensure all interactive gambling standards are met (including player protection, gaming fairness and responsible operator conduct).